One of the amazing things about Goodman Games and Dungeon Crawl Classics (and there’s quite a few amazing things) is the way they embrace third-party publishers. As Kevin said in his review of the newest DCC module ‘Hole In The Sky’ when he and I went to GaryCon I bought some zines while there. Okay. Some. ALL. All. The. Zines! And one lonely little module called “The Well of Souls” by Stormlord Publishing. We returned from GaryCon and a few weeks later our group decided to give Deadlands a play. It’s our “off” week and when we’re not ankle-deep in the moathouse of the Temple of Elemental Evil we switch it up. I always vote for DCC, but was outvoted and figured that Deadlands would be a good break and it’s always fun to try something new. Little did I know that I could have had both. 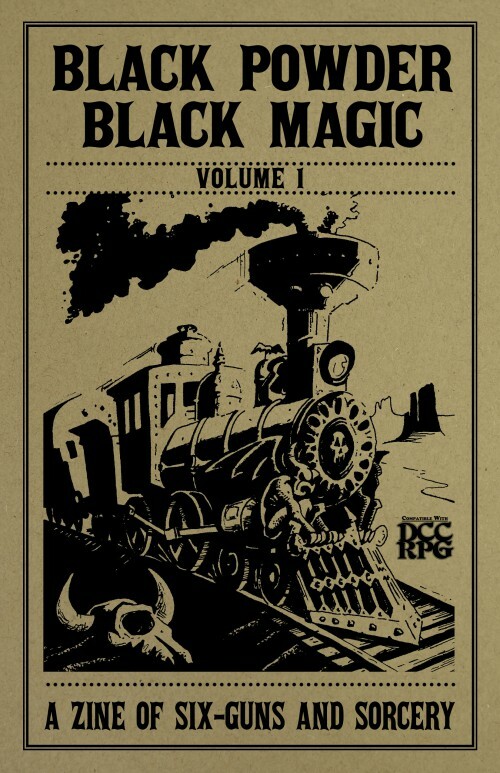 When I got back from GaryCon I noticed that Stormlord Publishing was pitching a new product: Black Powder, Black Magic: A Zine of Six-Guns and Sorcery. Having read through and been thoroughly impressed by “Well of Souls”, I quickly sent away for my copy and coincidentally got it back the same day we were to begin playing Deadlands. It’s fantastic. The end. That’s all you really need to know. If you like DCC. If you like Deadlands. If you like the “Weird West” anything… you need this product. The fact that it is “Volume 1” and they plan on doing more fills me with glee. Sample character: Benjamin, a paper-hanger with a paper-hanging stick (1d4) and a pot of glue, carrying an ace of spades with a name written on it who has come to Brimstone seeking to unravel the mysteries of the universe. 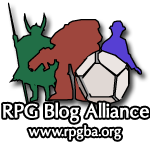 All kinds of great roleplaying opportunities with just a few rolls of some dice! You could definitely run the funnel as it is presented, and scattered throughout are numerous ‘hooks’ for increasing the world. More patrons, secret organizations, a cursed book, an old miner with strange powers… and more. The writing by Carl Bussler and Eric Hoffman really shines… there’s a four-page story at the end which I hope is setting the tone for Volume 2. The illustrations by Todd McGowan are all spot-on. I really cannot wait to start exploring Brimstone. I made a number of purchases at GaryCon. I am still reading and sorting through some of the adventures I picked up. My con-buddy and fellow Skyland Games guy Mike bought EVERY zine at the DCC booth. Needless to say he has got some reading ahead of him. Watch this space for reviews of those in subsequent weeks. 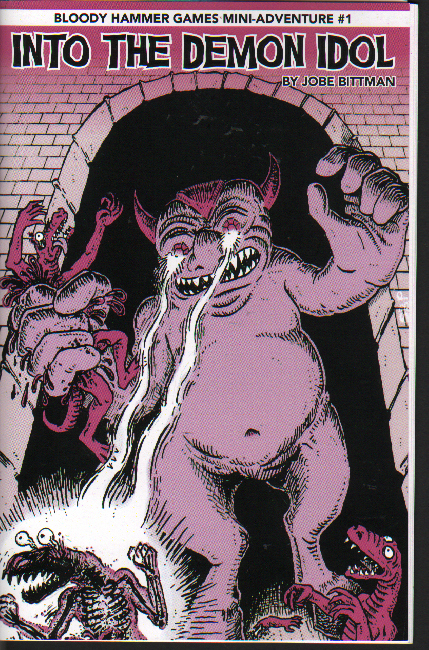 In the meantime, I finally read through Into the Demon Idol by Jobe Bittman of Bloody Hammer Games and Spellburn fame. This is the expanded edition of what was a very memorable 2013 submission to the one page dungeon contest. 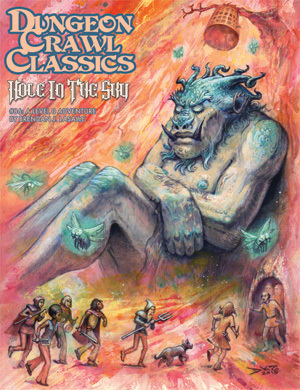 The premise is an adventure based around the iconic art from the cover of the 1e AD&D players handbook.The expanded print version provides some details about areas surrounding the temple, including a hex map with friendly towns, a fort, and a conclave of lizardman tribes that are the big threat to the region. I honestly don’t remember what I paid for it, as the purchase was made amidst a pile of others in the dealer room, and I haven’t been able to find an online price or source for a print or PDF version. It is 18 pages long in digest/zine format. Interestingly, while creatures are mentioned throughout the adventure, the stat blocks for them are printed on a separate insert for 3 systems: Dungeon Crawl Classics, Labyrinth Lord, and Swords and Wizardry. Fellow spellburner Jeffrey Tadlock provided the stats for LL and SW. I like how skill checks are handled. Since this could be played in several systems, skill challenges are just assigned as Easy, Average, Hard, or Very Hard, roughly corresponding with DC 5, 10, 15, and 20 respectively. 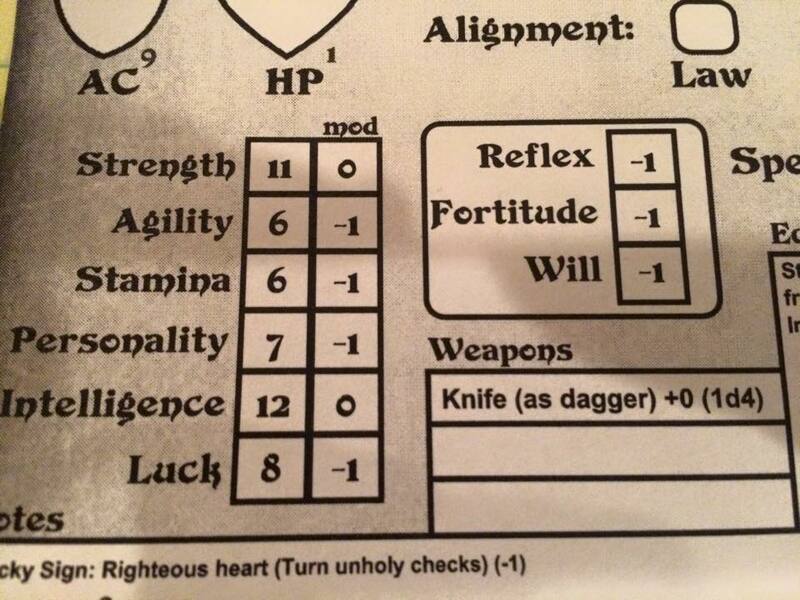 Despite referencing the typical AD&D stats in the skills section, throughout the text what would be DEX checks are instead referred to as Agility, revealing a DCC bias. Not that it’s difficult to figure out and adapt to whatever system you would like. Most of the creatures on the statblocks card have a variety section. Much like beastmen in the iconic Sailors on the Starless Sea or undead from the DCC rule book, there are variations on the creatures you encounter. Some lack much detail as to their effect. For instance, one type of lizardman can transmit lycanthropy with a bite (awesome! ), but is there a save? Do they turn into a werewolf or werelizard? Be prepared to roll with the punches and make some rulings on the fly. 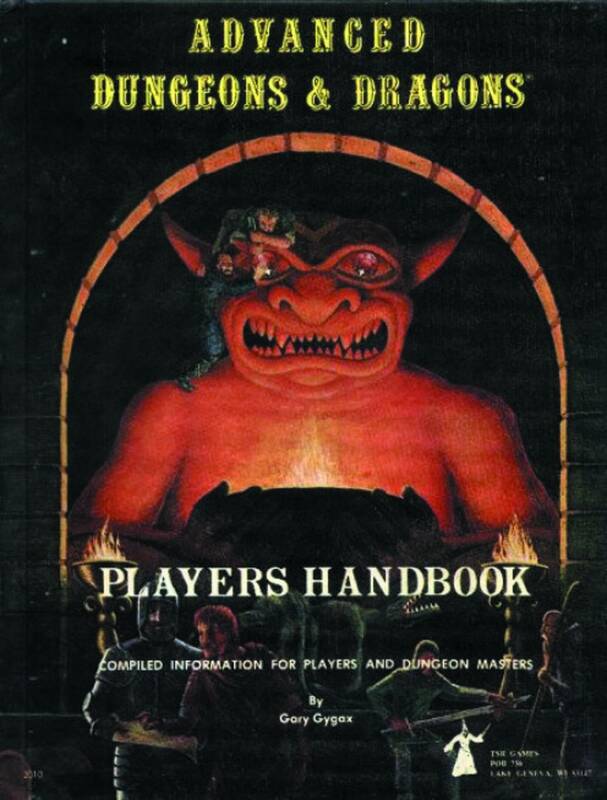 There is a lot of great stuff in this adventure, and the expansion on the one page dungeon would allow you to really take your time as you travel to the different points of interest on the map, and play out the final scene. I don’t want to mention what that is (because spoilers), but the cover of the adventure is a big clue. You could also feasibly run it at a con if you skipped the hex-crawl bit, and focused on the Idol itself. Overall, it will definitely provide a memorable game night or two, and makes me want to scan other iconic artwork for adventure ideas! If you are lucky enough to spot this in a dealer booth at a con, scoop it up! It has been a long wait for another official funnel after the now classic Sailors on the Starless Sea, but I’m here to tell you, Hole in the Sky does not disappoint. I had the fantastic fortune to land a spot in the author’s game of this during GaryCon, which was an awesome and unique experience. He had been running it off of notes in a notebook and illustrations off of his phone for several sessions, and our game ended up being the first time he had seen it in print. If you ever see Brendan LaSalle running games at a con near you, fight tooth and nail to get in to at least one. What this ends up meaning is that the survivors get a chance to spin the “wheel of destiny,” which ends up mechanically being a table that has modifiers applied to it based on the actions of the individual PCs during the adventure. Depending on the result, they may get the chance to re-roll their birth augur, re-roll an ability score, chose a new starting occupation, or be completely written out of history. This feature came out of discussions with players going thru the DCC funnel that got a birth augur that does nothing for their character, and the disappointment that comes along with that. I know I’ve had that discussion with many new DCC players, and Brendan decided to do something about it. It makes for a really cool and dramatic ending to the funnel experience, but what about the beginning and middle? Each scene in this adventure is both fantastically memorable and original, and somehow just what you would expect from the DCC line of adventures: outlandish, deadly, and something you won’t soon forget. 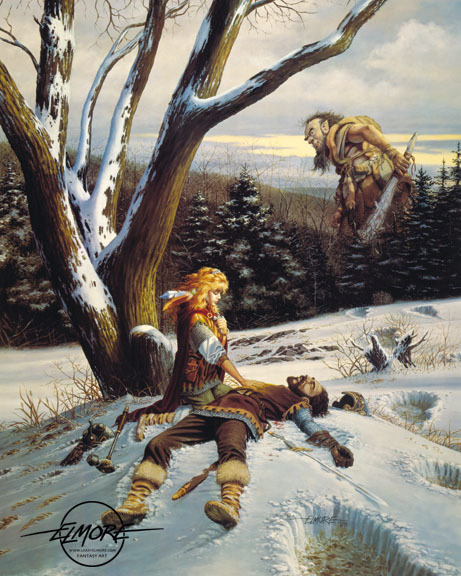 The design principles of DCC have matured and evolved in a way that steps out of the shadow of Tolkien-rooted fantasy rather quickly and creates unique encounters that keep characters guessing. Hole in the Sky is an excellent example of this. One of my favorite parts of this adventure is when the party meets up with another group of survivors being led by a dwarf named Karlos. I gained a point of luck for recognizing the Freaks and Geeks reference at the table. If you guys don’t get it, I would highly encourage you to check out the show that first brought James Franco together with Seth Rogen. It has a great cast, and a lot of fantastic moments, not the least of which is Franco’s character getting introduced to D&D. The only slight disappointment was that the cartography is not done by Doug Kovacs. I really got in to buying DCC adventures from the cartography. It’s not that Mark Allen didn’t do a fine job, but he has some huge shoes to fill. The picture of the titan in the map is really cool, as is the illustration in the back to the titular Hole in the Sky. Thankfully, as usual, we get to see Kovacs illustrate a member of the band meet their grisly end. The art throughout is excellent and features a lot of DCC regulars like Brad McDevitt, Steven Poag, William McAusland and Michael Wilson. This 0-level adventure would make for a memorable introduction to DCC for new players, as well as a fresh take on the funnel process with a nice twist at the end for DCC veterans. This one should be in your collection.